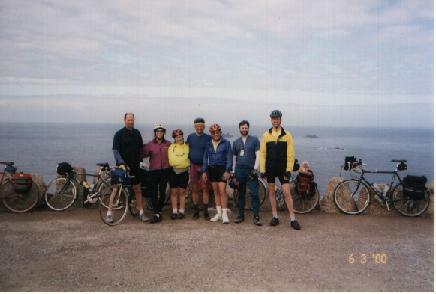 We were, of course, in high spirits when we finally finished posing for snapshots and getting official Land's End stamps on our route sheets, and actually started off on our great adventure. 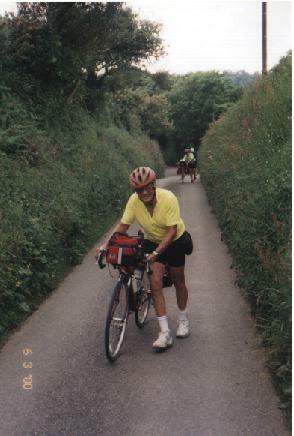 Just riding along the little lanes and getting used to the hedge rows, the small (and fast!) cars, and the short sight distances, was entertaining enough for me. The sea coast towns we visited were a great treat. 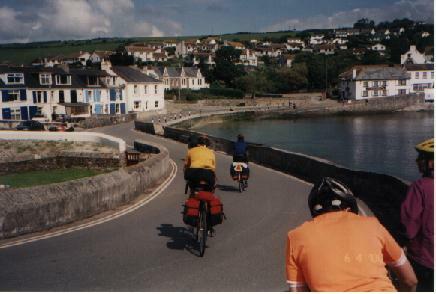 Mousehole (say "Mowzel"), Penzance, Marazion. Fantastic! We also got a good taste of the ups and downs we'd be 'enjoying' for the first couple of days, and we learned that cycling here, while wonderful in all respects, was hard work. We just barely made it to the hostel in time for dinner. 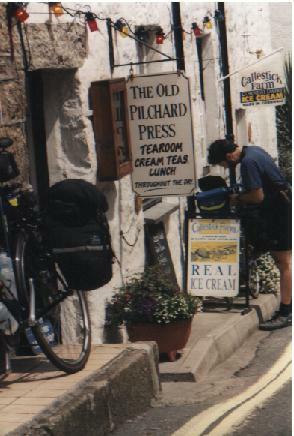 Good thing we packed in such a huge lunch at that little tea room in Mousehole!